I was only five pages into the preface for this book and I thought I was in deep trouble. The author, from all other accounts one of the foremost Jackson scholars of our time, is recalling a trip he made decades ago to Spain to review some newly unearthed documents. Upon reading that, I thought to myself, “This guy’s a historian?” I dreaded the idea that I was in for a long (this book is actually volume one of a three-volume biography on Jackson, all three volumes of which are on my book shelf, courtesy of a long-expired membership in the History Book Club) puff piece on the superior wisdom and nobility of this second generation forefather who so righteously expanded the reach of the grand American experiment. Fortunately, it got better. But only to a degree. On one hand, Remini proves to be a capable historian, skilled at placing his subject in the context of both his times and ours. For example, here’s an honest and well-crafted character study from one of the middle chapters. The occasion in question is Jackson’s decision to walk his army back to Nashville from Natchez after being called up prematurely for the war that would come in 1812. Ironically, the disastrous journey to Natchez and back proved a personal triumph for Jackson. All the things the volunteers admired about their General were amplified before their eyes: the determination, the fortitude, the personal courage, the strength of leadership, the personal identity with their small successes and many hardships, the consideration, the patience and understanding. What it all added up to was the fact that they admired him and trusted him, and so if he said they would walk from Natchez to Nashville, then they would do it. But something else emerged on the painful road home. It was a quality in Jackson’s character that is essential to an understanding of his subsequent military successes. The quality had probably always been there but now it suddenly billowed out into full view. That quality was will power. Not the ordinary kind. Nothing normal or even natural. This was superhuman. This was virtually demonic. This was sheer, total, concentrated determination to achieve his ends. So if he determined to march his men back to Nashville he would get them there even if it meant carrying every last one of the on his back. Andrew Jackson was not a great general. He was better than most of the commanders available in 1812, but that hardly does him credit. What distinguished him and basically made the difference between victory and defeat on the battlefield was his absolute determination to win—at whatever cost. As a consequence he was capable of extraordinary feats of courage and daring and perseverance in the face of incredible odds. Nothing less than victory was acceptable. Defeat was unthinkable. Remini does well here, balancing the good with the bad, reporting the facts as he uncovered them and understood them to be true. Yes, Jackson was a special individual, but not necessarily and automatically a great one. Like most people, he was a mix of talents and foibles—the only thing that makes Jackson exceptional is the historical circumstances that filtered those talents and foibles to the extent they did. One thing I always find interesting about these massive biographies of pivotal political figures is the treatment given to their childhood and developmental years. The better historians stick to a clear, “just report the facts” style, rarely making judgments about the role the trails and traumas of youth had in shaping the adult. And again, Remini generally does a good job here, albeit acknowledging that many previous Jackson biographers have not. Here’s an example. 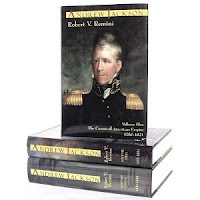 At fifteen, Jackson and his older brother, Robert, were soldiers in the Revolutionary War, and they were taken prisoner, where they both suffered from neglect and malnutrition. When they were finally exchanged, their mother, Elizabeth, came to collect them. Elizabeth blanched when she saw her sons, so wasted were they by disease and malnutrition. Robert, in serious condition, could neither stand nor sit on horseback without support. Elizabeth procured two horses, placed the dying Robert on one and rode the other herself, keeping careful check on Robert to prevent him from collapsing to the ground. Poor Andrew had to walk the forty-five miles home barefoot and without a jacket, his body throbbing with pain. On the last leg of the journey a driving rain drenched the trio. And that was the final blow. The smallpox that had been raging within Andrew burst out in the loathsome sores so typical of the disease. Somehow Elizabeth got her two sons home and put them to bed. Two days later Robert Jackson was dead and his brother delirious and in mortal danger. Jackson survived (obviously), but as soon as he was strong enough, his mother left him to help nurse other prisoners of war, including two of her nephews, in Charleston. There, she caught cholera and quickly died herself. Remini dutifully reports what others have assumed about Jackson’s character as a result of this unfortunate incident. One writer contends that, but Remini? One thing is certain: he suffered a staggering blow, one he probably never understood, one he could never mention or discuss. If he did feel rage against Elizabeth, he disguised it or rechanneled it. Nothing in his writing suggests resentment against her. Nowhere does he blame her for deserting him. Early biographers claim that he “deeply loved” his mother, which may or may not be true. But they noticed something else which was definitely true: he “imbibed a reverence for the character of woman.” He respected women and treated them courteously—far beyond what was expected of him as a proper gentleman. If he hated his mother, would he so revere “the characters of woman”? Would he treat them with such marked respect and kindness? Good questions. And like a good historian, since it is ultimately conjecture, Remini allows to reader to formulate his own answer. Your sacrificing all private confidence by making publick my private letter merits & receives my utmost indignation, Sir the baseness of your heart in violating a confidenc reposed in you in an hour of intimate friendship, should as I conceive it was between you and me, by the most solemn obligation will bring down the indignation of the thinking part of mankind upon you & the thunderbolt you were preparing for me will burst upon your own head, it will occasion that part of mankind, that heretofore view’d you worthy of publick confidence to pause a moment & reflect how far a man is worthy of publick confidence who has violated all kind of private at the Shrine of malice occasioned by goaded disappointment, the Western world will think for themselves like freemen as they are & view the man who had made such sacrifice as you have done, capable of betraying all publick confidence to private interest. To which I say, huh? So Remini is able to win me back after his stumble in the preface through the obvious balance he is attempting to bring to his subject. Those concerns recede into the background and I get more engaged with the actual details of Jackson’s life. I discover that Jackson was one of only a handful of influential men who helped shape and form the new state of Tennessee. This is a fascinating section of the book and of Jackson’s life, primarily because Tennessee was one of the first such states to be created and admitted to the Union under the Federal constitution. The problem was complicated further by the fact that 1796 was a presidential election year. George Washington had had enough after eight years in office; the verbal abuse he had suffered over the Jay Treaty was more than he chose to endure. The Federalist Party put forward John Adams for the presidency and the Republican Party nominated Thomas Jefferson. Since the Republicans were popular along the frontier because of their strong states’ rights position and their commitment to the needs of the farmer, the Federalists recognized that Tennessee’s admission to the Union would automatically increase Jefferson’s electoral count. There was also sectional rivalry in the presidential contest. Adams came from New England, Jefferson from the South, and Tennessee, a southern as well as a western state, would upset the balance. As a result, there was a debate in Congress over the validity of the census Tennessee had conducted to certify that they had enough citizens to become a state. One may think that the issue at stake actually was the validity of the census, since that’s what Senators and Representatives argued about. But in fact it wasn’t. The issue was how many electoral votes each party could garner, and the census was only the football that the two teams kicked back and forth. The House, where Republicans held the majority, liked the census. The Senate, where Federalists held sway, didn’t. The compromise eventually struck, revealed what was actually at stake. Tennessee would be admitted, but with fewer electors than it would ordinarily be entitled to, until after the federal census of 1800 (and the pending presidential election) was conducted. The more history I read, the more episodes like this jump out at me. The modern American has lost an understanding of what truly motivated his predecessors in taking the actions they did. To us, history is nearly always just so many facts and figures. An understanding of the underlying motivations not only opens up a much richer world, it helps us realize that those long ago people were really not all that different from their modern counterparts. Another parallel to modern times comes when Remini discusses the Louisiana Purchase in 1803. Although [President Thomas] Jefferson had grave doubts about the constitutionality of the purchase, he knew the alternative should any foreign power control New Orleans; it included the possibility of rebellion or treason by citizens of the southwest. “To lose our country by scrupulous adherence to written law,” he reasoned, “would be to lose the law itself, with life, liberty, property and all those who are enjoying them with us; thus absurdly sacrificing the end to the means.” Burdened with fears that he was reducing the Constitution to a scrap of paper, he went ahead with the purchase anyway. But he had no choice. The safety of the Union dictated it. To which the libertarian streak in me replied sarcastically: Of course. It’s always the “safety of the Union” that’s at stake when Presidents trample on the Constitution. But this situation actually did make me think. Despite my kneejerk libertarianism, there is a larger point to be made. In a situation where strict adherence to the Constitution would concretely result in the destruction of the country, isn’t there an honest case to be made for the government to transcend the shackles of its founding document? I mean, if you take the long-view, then no. If you believe that countries themselves should rise and fall rather than stain individual liberty, then of course the answer is no. Then it’s strict adherence all the way to the grave. But if you believe the country in its current form should be preserved—which I suppose all Presidents honestly do—then doesn’t it rationally make sense to circumvent the Constitution from time to time, in order to preserve the country that cherishes it? Can we say yes to that question without that libertarian streak speaking up again? Doesn’t the Constitution define the country? And doesn’t the country you’re trying to preserve cease to exist the moment you circumvent that document? It’s a tangled little political and philosophical puzzle, one much easier to arbitrate in the abstract than in the hard reality of the Louisiana Purchase, or the Civil War, or in the wake of 9/11. But then Remini reveals another interesting note on the Louisiana Purchase. In fact Britain disputed—correctly—the legality of the Louisiana Purchase. France had no right to sell it to the United States since the Treaty of San Ildefonso of 1800, by which Napoleon had forced Spain to surrender Louisiana to him, specifically stated that France would not sell or otherwise alienate the territory without first offering to return it to Spain. When Napoleon blithely ignored his own previous agreement with the Spanish government and sold Louisiana to the United States, many other nations regarded the action as illegal. Didn’t know that. Not only did Jefferson violate the Constitution when he purchased Louisiana from France, he evidently violated international law as well. Jackson’s story really accelerates with the War of 1812. Today, we know almost nothing about this conflict, but to understand why it made Jackson famous, you have to understand the delicate phase of America’s development as it existed in the years before that war. The country had entered the war with a desperate need to prove its right to independence, but the last two years seemed to prove the reverse, that the United States was only a temporary experiment in freedom, that its independence was undeserved. And on this crumbling stage, Jackson appears, leading American troops to a smashing victory over the British at New Orleans. It was a lopsided battle, and although Jackson admittedly deserves credit for capably leading it, the effect that his victory had on his nation still seems out of proportion. And Jackson gets all the credit. The nation’s faith and confidence in itself had been restored by General Andrew Jackson. He alone was responsible for giving the country back its self-respect. He had “slaughtered” a magnificent British army—over 2,000 victims, a figure that seemed incredible at that time—and repelled the greatest armada in history. In the public mind, all of this was associated with Andrew Jackson—not simply because of the magnitude of his victory over the British (although that was certainly important) but because the announcement of his colossal feat immediately preceded the announcement of the conclusion of the war. The tremendous boost to everyone’s morale that his accomplishment on the battlefield provided was followed a few days later by the news of the peace treaty—and people tended to fuse the two events together. The result was the feeling that Andrew Jackson had come like some special messenger of the Almighty to rescue His people and preserve their freedom. Small wonder that Jackson’s place in the pride and affection of the American people lasted until his death—and beyond. Small wonder that his popularity exceeded that of Washington, Jefferson, or Franklin. I think it’s critical to understand what this victory did for Jackson—both for himself directly and, more importantly, for him in the mind of his countrymen. His fame would help him go on to do other things—some good and some not-so-good—but it was his victory at New Orleans that made him a permanent fixture in the pantheon of American heroes. Remini—I think correctly—gives Jackson credit, above all others, for engineering the circumstances which would in time result in the eviction of all native peoples from what is now the Eastern United States. It is one of the things he goes on to do with the fame he won at New Orleans, and the detailed history of the Indian wars he fought and the Indian treaties he signed constitute the second half of Remini’s overall narrative. It is sometimes a disturbing account to read, and it is here, I think, where I begin to lose respect for Remini’s objectivity. From a chronological perspective, the peace treaty that Jackson negotiates at the end of The Creek War is the first nail in the coffin. The Creek War and the resulting Treaty of Fort Jackson were the beginning of the end not only for the Creek Nation but for all Indians throughout the south and southwest. What Blount, Burr, and hundreds of others had failed to do, Andrew Jackson accomplished. Millions of acres of choice land had been ripped out of the Indian domain and placed under the auction hammer of the land speculator. And the Indians must remove to get out of harm’s way—for their own good. So the pattern of land seizure and removal was established. Within twenty-five years the entire family of red men, Creeks, Cherokees, Chickasaws, Choctaws, and Seminoles, were swept from the south and either buried under the ground or banished to the remote western country beyond the Mississippi River. And from start to finish the man most responsible for this expansion of the American empire was Andrew Jackson. In the long history of Indians in North America the Creek War was the turning point in their ultimate destruction. The certain, the inevitable, the irreversible turn toward obliterating tribes as sovereign entities within the United States now commenced. The Creek Nation was irreparably shattered. All other tribes would soon experience the same melancholy fate. It is a strange legacy for a man to have—lauded as he must have been by his contemporaries and by several generations following, but now coming more into infamous repute. Remini recognizes this, but it’s not clear that he sympathizes with the more modern perspective. He absolutely does not shy away from reporting Jackson’s obvious racism against the Indians. He tells us how Jackson fought ceaselessly against them, viewing them as the gravest threat to the productive growth and expansion of his country. And Remini attributes this opposition not to hatred, but rather a strange and compelling logic. His logic was simple: Indians were savage and warlike because they possessed too much land to roam in and therefore pursued “wandering habits of life.” If the range of their activities were sharply restricted, their errant habits would gradually subside “until at last, necessity would prompt them to industry and agriculture, as the only certain and lasting means of support.” And by being industrious like white men, Indians would eventually share the blessings of civilized life. Thus, for the Indians’ own safety and welfare, it was necessary to seize their property and restrict their movement. It can easily be argued that this logic is a fraud, a ready justification for theft—and that is true. But it is also true that Jackson and westerners like him believed the argument. Later, in precisely the same way, they would justify the removal of the Indian beyond the Mississippi River. The argument was never simply invented to serve as a coverup. It was always there, a part of their creed, a doctrine of incontestable truth. Remini may be right in this regard. Jackson’s own statements about the threat posed by the Indian, and his nation’s obvious and fundamental right to oppose that threat, read like rhetoric many American use today when talking about terrorists. A large number of Americans for all generations, it appears, believed that the United States had and has the right to force other cultures and nations to bend to its will. In many cases, now and then, force is seen not just as necessary, but as the preferred alternative. Remini reports that sometimes, rather than forcing Indians off desirable land, the chiefs were paid to voluntarily relocate their populations. The necessity of bribing the chiefs to obtain their land disgusted Jackson. It was not his style. He much preferred having the United States step in to impose its authority over the tribes, simply telling them what they must do. If this could not be done, he said, then he wanted no part of such negotiations. They revolted him. Indeed, Andy. Why resort to base commerce when force is so much more noble? At a later point, Remini makes a critical observation about Jackson’s view towards the Indians. Again, he steers carefully away from hatred and racism. The key to understanding Jackson’s attitude toward the Indian is not hatred but paternalism. He always treated the Indians as children who did not know what was good for them. But he knew, and he would tell them, and then they must obey. If they refused, they could expect a fearful punishment from a wrathful parent. This may be a fair comment, but then I think, Remini undercuts himself, and goes too far into excuse-making. But there was nothing extraordinary about this paternalism. It in no way demonstrated bigotry, racism, or any other prejudice against Indians simply because they were Indians. Jackson was just as paternalistic toward his soldiers. As long as they obeyed him, as long as they demonstrated discipline and loyalty, he praised them without stint; but let them falter in their duty and he could exact the supreme penalty. More on that “supreme penalty” business below. But the key difference here, of course, is that Jackson’s soldiers were placed under his subservient command by the duly established ethics and practices of his own society. To the best of my knowledge, the Indians were not, nor could legitimately be. At this time, they constituted people of an independent community, as separate from the people of the United States as those of France or Spain or Great Britain. Nor was this paternalism unique to Jackson. Any number of white men, particularly government officials, practiced the same paternalistic attitude toward the Indians. It was a very common approach and the accepted mode of behavior. The Indians themselves adopted the language of paternalism and frequently spoke of themselves as children of their father, the President. This “Great White Father” moniker is most perplexing to me. It may be true that the Indians adopted this terminology in both word and thought, but if so, it was certainly thrust upon them by the paternalistic attitude of men like Andrew Jackson. Read some of the formal statements he issued and you will begin to see not just how paternalistic, but how condescending and hostile the language was. Here’s how Remini describes the Indian reaction when General Andrew Jackson was tasked with the conquest of Florida. I’ve added the emphasis myself. The appointment of Jackson as executioner threw the Indians into wild alarm. Many of those living on the American side of the boundary within lands claimed by the United States under the Treaty of Fort Jackson fled in terror to Florida when they heard the dreadful news of his appointment. To the Indians General Andrew Jackson had assumed the character and form of an evil spirit: He need only point at them and they perished where they stood. “Great White Father” indeed. And how did Jackson feel about this obvious mischaracterization of his intentions? Jackson encouraged his reputation—not as executioner but as stern father and wise judge who would protect his Indian children (he actually believed he defended Indian rights) provided they obeyed him without question and closed their ears to false friends and prophets like the English and Spanish who encouraged them in their lawlessness. The parenthetical comments indicate to me that Remini believes Jackson was delusional—not just by our standards but by the standards of his time. Which is odd, because although Remini does not offer Jackson any absolution, he does entreat his readers not to judge him too harshly. Again, the emphasis below is mine. The frightful blows sustained by the Indians at the hands of Andrew Jackson, supported by the United States government, in the destruction of the Southern tribes have elicited appropriate criticism and indignation from latter-day Americans. But to understand the meaning and significance of Jackson’s actions, one must view them in the context of the nineteenth century, not that of the late twentieth century. It cannot be ignored or forgotten that a powerful need existed throughout the country during Jackson’s lifetime to subdue the Indians and expel them from territory that was believed to be essential to national expansion and the defense of the country. Jackson was not only a product of that need but the man most responsible for fulfilling it. His military skill and undeviating determination combined to annihilate the Indian tribes and propel thousands of Americans across the south and west. His decree, more than any other, forever separated the white and red races. Surely, no higher purpose can be served than national expansion and defense. I think Germany might have felt the same justification in 1937. But, more importantly, the observation that shatters Remini’s whole argument is this. Since when does paternalism lead to annihilation? And annihilation not by accident but by design? Does the father which to destroy his children? Is genocide really what’s best for them? Finally, it’s not unusual when reading one of these historical biographies for me to stumble across a minor episode that strikes me with the uniqueness of its human story, filling me momentarily with the desire to turn it into my next great novel. First it was Teddy Roosevelt and his son Kermit and the time they spent together on the River of Doubt. Then it was John and John Quincy Adams crossing the Atlantic for the first time on the Boston. Then it was Sarah Ellis Dorsey and the life she led and the lives she nurtured at Beauvoir. Now, it’s General Andrew Jackson and a soldier named John Woods. During the period of Jackson’s determination to instill absolute discipline in his troops there occurred an incident that would haunt Jackson throughout his military and political life, an incident that convinced people, and indeed engraved it forever in their minds, that Andrew Jackson could be a ruthless, pitiless killer. John Woods was hardly eighteen years of age when he enlisted in the militia. He belonged to a company that had caused considerable disciplinary problems, although apparently Woods himself took no part in the trouble. In any event, the young man was standing guard one cold, rainy February morning. After obtaining permission from an officer to leave his post, he went to his tent for a blanket. There he found that his comrades had left him his breakfast, and he calmly sat down to eat it. A few minutes later an officer entered the tent and, using abusive language, ordered him to return to his post. Woods, who had received his permission to leave his post from a different officer, refused to obey the order. An argument ensued and the officer ordered Woods’s arrest. Then the young man went berserk. He grabbed his gun and swore he would shoot the first man to lay a hand on him. As the quarreling intensified, someone informed Jackson that a “mutiny” was in progress. The stage is set. What will our grizzled old hero do? Returned as he is by narrative to the vim and vigor of youth? The cry “mutiny” was electrifying. Jackson bolted from his tent. “Which is the damned rascal?” he shouted. “Shoot him! Shoot him! Blow ten balls through the damned villain’s body!” In the meantime Woods had been persuaded to give up his gun and submit to arrest. An impulse, yes. But justified, no? A rank traitor within his midst? How else should a commander react? Most soldiers thought nothing much would some of the incident. Such things had happened before and the offender was usually dismissed without pay or drummed from the camp. Then, too, militiamen were special; they had rights no others enjoyed—such as freedom from capital punishment for mutinous actions. But Jackson was determined to make an example of Woods. Of course he was. Rights of man? Posh! He flaunted my authority over him! He broke the chain of command! He had Woods courtmartialed on a charge of mutiny. The young man pleaded not guilty, but the court found unanimously against him and ordered his execution. Several efforts were made to win clemency for Woods, but the stern commander turned a deaf ear. On March 14, two days after the trial, John Woods was shot to death by a firing squad in the presence of the entire army. As well he should have been. Let that be an example to the others. Many years later, when Jackson sought the presidency of the United States, the circumstances of Woods’s death were recounted in newspapers around the country in attempts to prove that Old Hickory was a butcher who could have imposed a milder sentence for Woods’s momentary rebelliousness but chose instead to snuff out his life. Petty newspaper scribblers! What do they know of leading men into battle? The punishment was indeed harsh. Under different circumstanced Jackson might have been more lenient—although he was most unpredictable—but his experiences of the previous December and January left his mood and temper strict and unyielding in matters of discipline. Which was understandable. He had kept a force in the field despite massive desertions and the worst possible hardships. That experience toughened him. As far as he was concerned, the troops must be made to understand their duty whatever the circumstances—even if it meant the sacrifice of a young man’s life. Exactly! You understand, don’t you. You must! An Iron General had been fashioned by painful experience. If possible Jackson’s already cold will and steely determination intensified. He became a relentless, driving, indefatigable machine devoted to one solitary purpose—the destruction of his country’s enemies. And those enemies are everywhere, aren’t they? Even here on this block with me, staring into my windows while avoiding my eyes on the street. The vermin! Would I had the power now I had back then. Maybe it’s a short story instead of a novel.